Visual Studio Code>Programming Languages>Mongo RunnerNew to Visual Studio Code? Get it now. MongoDB Runner is a VSCode extension to connect MongoDB instance. 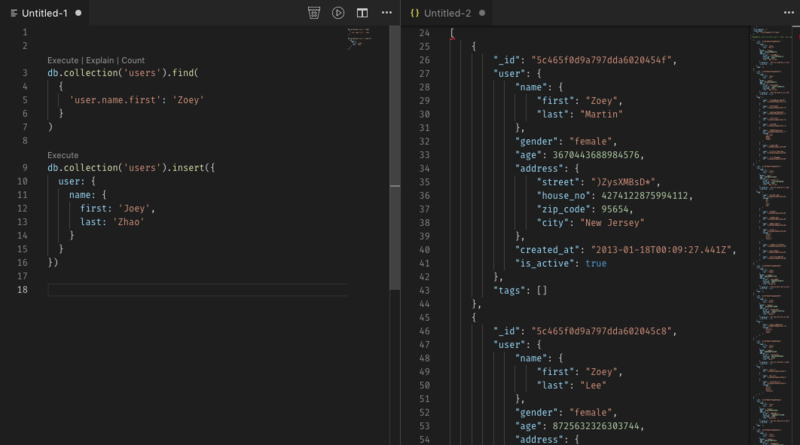 Mongo Runner is a VSCode plugin helps developers to connect to their MongoDB instance to do some basic operations such as: simple query, tree topology, index, server statistics etc. Mongo Runner provides general operations about using MongoDB. It can connect to Mongo Single Instance, Mongo Replicaset and Mongo Shard Cluster. By open MongoDB Runner editor, you can running MongoDB NodeJS driver inside VSCode and get the output on the right view. Setup MongoDB Connection in your workspace setting. Be aware that the name for each connection need to be unique. In order to secure user's password, we don't support put password in the configuration file as plain text. Instead, when you specify the user name in the configuration file, MongoDB Runner will prompt you to input the password. For SSl connection, please use options configuration. You can also put all other mongo connection options there. Please submit any issues you found or any suggestions on github issues. While MongoDB Runner is generously offered to everyone free of charge, if you find it useful, please consider supporting it.